Royal Caribbean announced the new features and amenities that will be offered on the newest, largest and most expensive cruise ship in Asia, Spectrum of the Seas. Spectrum of the Seas will be Royal Caribbean's first Quantum Ultra Class ship, and will boast the cruise line’s first private enclave for suite guests, new stateroom categories, innovative dining concepts, and stunning features and experiences – many of which have never before been seen at sea. Spectrum of the Seas will be able to accommodate 4,246 guests at double occupancy and 1,551 crew members and will sail from Shanghai starting in June 2019. 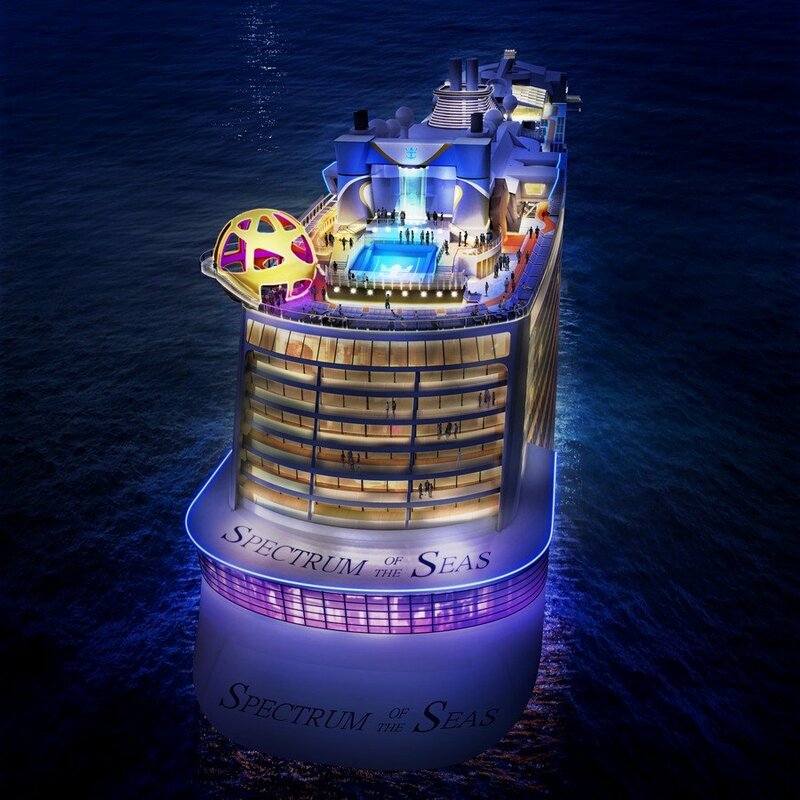 As we reported earlier, Spectrum of the Seas will offer a number of innovative features onboard. Here is a rundown of what will make Spectrum different from other ships. Custom built for the Chinese market, Spectrum of the Seas will feature bold and unexpected experiences, including the iconic Sky Pad, a virtual reality, bungee trampoline experience located on the aft of the ship. Guests will strap in and don their VR headset to transport them to another time and planet. The out-of-this-world experience is for guests of all ages, and also can be enjoyed without headsets, for those who prefer to look out over the ocean as they leap toward the sky. A brand new experience to any Royal Caribbean shop is Star Moment, which is described as a lively and energetic karaoke venue where family and friends can belt out and sing like stars. The cruise line also will enhance SeaPlex – the largest indoor sports and entertainment complex at sea where families can enjoy bumper cars, roller skating and basketball – with new augmented reality walls and floors, providing guests with thrilling, high-tech interactive experiences. Spectrum of the Seas will also offer other signature Quantum Class offerings, such as the North Star observational pod, RipCord by iFly sky diving simulator and the FlowRider surf simulator. 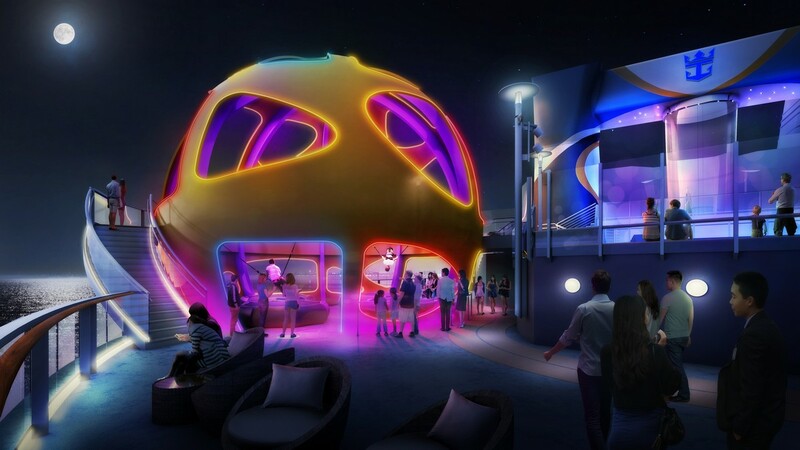 The popular Two70 venue will also be available on Spectrum of the Seas and will feature the Vistarama technology, which transforms the panoramic windows into a projection surface more than 100 feet wide and over 20 feet tall showcasing spectacular digital shows. The innovative Vistarama is complemented by six agile Roboscreens, measuring over 7 feet tall and controlled by powerful, yet nimble robotic arms that create scenes as they soar and twist solo or as one. 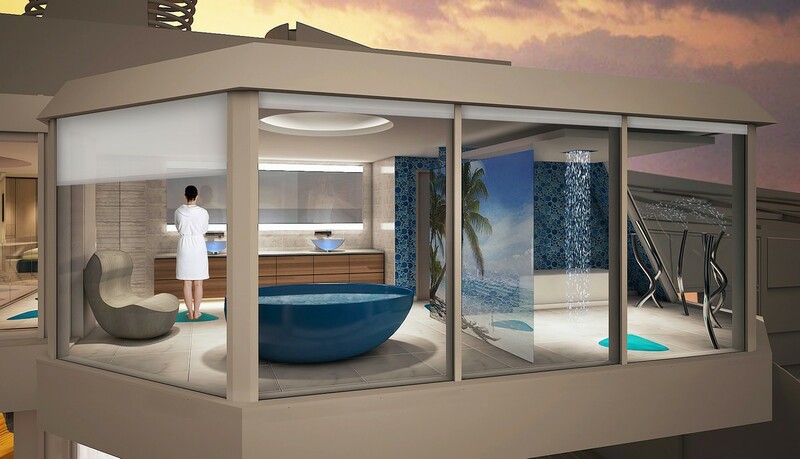 Spectrum of the Seas will offer Royal Caribbean's first exclusive suites-only area, which will feature the exquisite Golden and Silver suite accommodations in a private enclave at the forward end of the ship on decks 13 through 16. Guests booked in these type of suites will have special keycard access, a private elevator and a dedicated restaurant and lounge. In addition to a range of exclusive amenities, guests will have access to The Balcony – a private outdoor space for sunbathing and relaxing – that offers the best views on board; and The Boutique, a shopping area where travelers can book private shopping experiences. 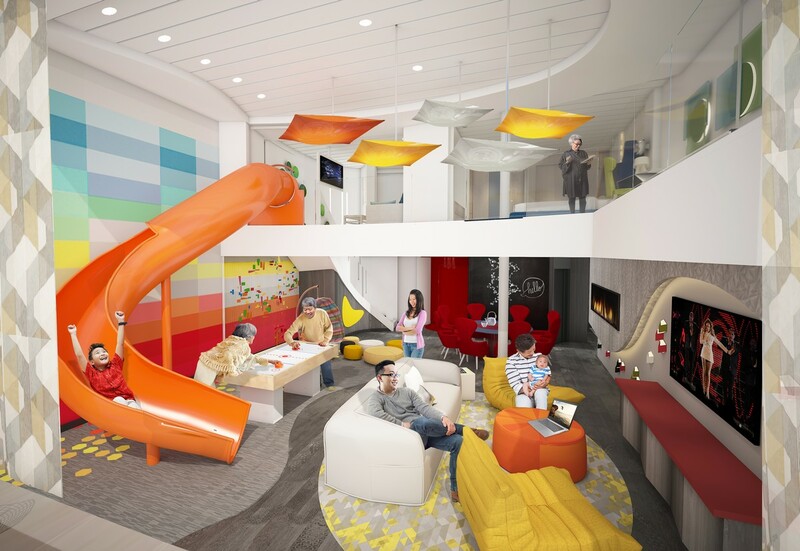 Spectrum of the Seas will introduce the two-level, 2,809-square-foot Ultimate Family Suite, accommodating up to 11 guests. 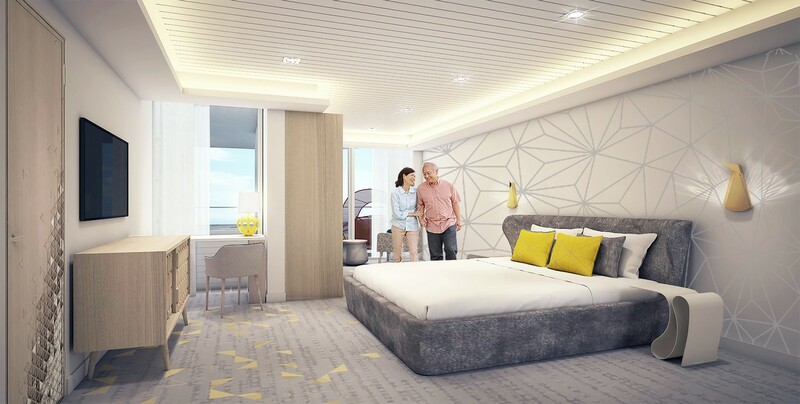 The three-bedroom suite, which will include a master bedroom with a bathroom that extends over the side of the ship to provide unparalleled ocean views, along with two additional suites for grandparents and other family members. Kids have their own kid-friendly space on the upper level, complete with an in-suite slide that will transport them to the living area below. Everyone in the family can enjoy time together in the recreation room, featuring surround-sound equipment for a night of karaoke, movies or video games. Royal Caribbean will offer a three-level main dining room on Spectrum of the Seas with a capacity of 1,844 guests. The cuisine served in the main dining room will serve a variety of Chinese and Western a la carte options that rotate each day of the sailing. Royal Caribbean will offer the Windjammer Marketplace as a more casual option. On Spectrum, the Windjammer will be 20 percent larger than those on Quantum Class ships and feature a buffet selection of Chinese and Western dishes, including noodles, pizza, Japanese teppanyaki and mini hot pot. Sichuan Red will be a new specialty restaurant, located in the Royal Esplande, and will serve authentic cuisine from the Sichuan province of China. Royal Caribbean’s popular signature restaurants, including Wonderland’s Dadong – a new outpost of Chinese chef Dong Zhenxiang, renowned for his much-coveted roast duck dish; Jamie’s Italian by British celebrity chef Jamie Oliver; Izumi Japanese cuisine; and Chops Grille will join the lineup as well. In addition, the new Leaf and Bean traditional tea room and café parlor will debut on the Royal Esplanade. The quaint spot will offer a range of authentic Chinese teas, classic coffee drinks as well as freshly baked Chinese and Western desserts and pastries. When Spectrum of the Seas debuts in April 2019, she will sail a 51-night Global Odyssey from Barcelona, Spain to Shanghai, taking vacationers to 13 countries. Guests with limited time also can choose to sail one or more of the five separate segments of the Global Odyssey. When Spectrum arrives at her new home in Shanghai in June 2019, she will introduce new itineraries with visits to new ports, such as Hakodate and Niigita, Japan; Ilocos, Philippines; and Vladivostok, Russia. In winter 2019, the ship will reposition to Hong Kong to offer special holiday cruises. These new itineraries and more are now open for sale.